Who says you have to follow the screenwriting rules? In this book Pilar reviews the rules writers assume they should follow, discusses why they’re there in the first place, and then shows you ways to creatively break them! Why writers should break the rule. 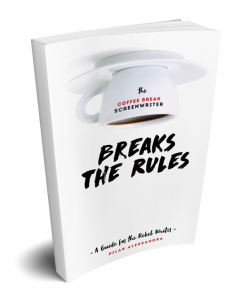 How writers can break the rule. How breaking the rule can break bad (so break with care). 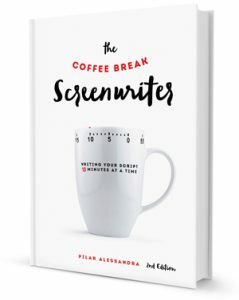 THE 2nd Edition of the Coffee Break Screenwriter! “ON THE PAGE” INSTRUCTIONAL DVD NOW STREAMING! ON THE PAGE PODCAST GOES INTO IT’S 10TH YEAR! More information. More interviews. Go to PODCAST on this website or subscribe on iTunes to the On the Page Podcast. Past 200 episodes include Adrian Molina, Ed Solomon, Molly Shannon, David Nutter, Peter Bogdanovich, Terry Rossio writers from The Walking Dead, Homeland, Silicon Valley, The 100 and more!